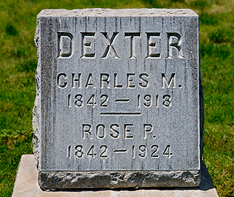 Charles M. Dexter retired to Riverside in 1890. He had been a student of many subjects, earned a medical degree but never practiced as a doctor, and served as a Union soldier in the Civil War where he earned the rank of Captain. Dexter’s true vocation, however, was the development and founding of Fairmount Park. Fairmount Heights subdivision and Fairmount Heights Tract maps were filed in 1892 by John G. North, son of Riverside’s Founder. North Hill, overlooking the area, was likely named for his father, John W. North. The City of Riverside purchased 30 acres of the property, 10 acres of granite the city planned to mine for curbs and road bed, and 20 acres of what was considered worthless bottom land, for $10,000. Several springs and streams converged in the bottom land, including Spring Brook. Charles Dexter began to interest his fellow Civil War veterans and members of the Grand Army of the Republic organization in tree planting and improving the bottom land for a picnic ground. Dexter persuaded the city to underwrite the cost of trees and organized a committee to oversee volunteer work to improve the park site. The City made him chair of the committee and took over direct responsibility for park development. S.C. Evans gave additional land and the water right to Spring Brook for the creation of Fairmount Park Lake, probably at Dexter’s urging. While there had been talk of naming the lake for Dexter, Evans generous donation was recognized by naming it Lake Evans. The park itself was designed by the firm of Fredrick Law Olmsted, designer of New York’s Central Park and Prospect Park. The major road circling the lake is named for Dexter. Later, Evans descendants gave another 18 acres plus money, making the enlargement of the park and lake possible.